FILE - Roses and slogans reading ''Free Lee Ming-che'' are placed on the lawn during a media event to support Taiwanese activist Lee Ming-che detained in China, in Taipei, Taiwan, Nov. 28, 2017. As the world marks International Human Rights Day this Sunday, Chinese advocacy groups will be watching to see if U.S. President Donald Trump follows through on a pledge earlier this year to sanction individuals accused of human rights violations under the Global Magnitsky Human Rights Accountability Act. In September, a coalition of 23 rights groups submitted a list of 17 police chiefs, public prosecutors and heads of security services to the State Department for review. The individuals, described as "human rights thugs," are from 15 countries, including China and countries in central Asia. They are accused of involvement in cases where prisoners were tortured, executed or died in custody. The Global Magnitsky Act, which former U.S. President Barack Obama signed in December 2016, expands the scope of 2012 legislation that froze the assets of Russian officials and banned them from traveling to the US because of their links to the 2009 death in prison of whistle-blower, Sergey Magnitsky. If approved, the adjusted bill will authorize the U.S. government to impose sanctions, including visa bans and asset freezes on individuals, whom rights groups described as "human rights thugs." The act requires the Trump administration to report to Congress by this Sunday on sanctions it has imposed under the law. In an April letter to U.S. lawmakers, Trump noted the administration's support for the "important legislation" and said the administration was "actively identifying persons and entities to whom the act may apply and are collecting the evidence necessary to apply it." A State Department official said Friday the government does not comment on the status of investigations or plans to designate an individual or entity, and cannot talk about the implementation of the act before the report is submitted to Congress. "We always welcome and appreciate collaboration with nongovernmental organizations," the official told VOA in a statement. "Per Section 1263(c) of the Act, we consider credible information that will meet the legal threshold for designation, provided by nongovernmental organizations that monitor human rights violations and corruption." 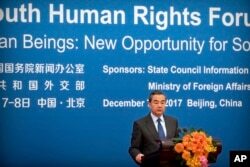 Chinese Foreign Minster Wang Yi speaks during the South-South Human Rights Forum at the Great Hall of the People in Beijing, Dec. 7, 2017. Among those on the list are Chinese Deputy Minister of Public Security Fu Zhenghua and Beijing's Municipal Public Security Bureau deputy head Tao Jing. The coalition accused the duo of bearing "command responsibility" in connection with the 2014 death of Chinese rights activist Cao Shunli. Cao was reportedly denied medical treatment until she was seriously ill, an accusation the Chinese government has denied. Once blacklisted, both Fu and Tao "will be denied visas to enter the U.S. and their assets in the U.S. will be frozen and banned from transacting. This will pose a great force of deterrent to many Chinese Communist officials" who have taken part in rights abuse cases in China, said Teng Biao, co-founder of the China Human Rights Accountability Center (CHRAC). a group that participated in submitting the list to the U.S. government. Teng called sanctions under the act the most powerful and effective tool to intimidate potential human rights abusers in China, whose human rights record he said was one of the worst in the world. Teng added that if President Trump reaffirms his support for the act by approving the blacklist to mark this year's Human Rights Day, global rights groups will be greatly encouraged and prepared to nominate more Chinese rights thugs in the coming year including those who should be held accountable for the death of late Nobel Laureate Liu Xiaobo. "China's top-ranked officials have to shoulder responsibility over Liu's conviction, imprisonment, torture and death," said Teng, a Chinese rights lawyer who now lives in the United States. "But for practical reasons of evidence collection, we may have to target those who were directly involved in his case including, for example, police, prosecutors, judges and prison officers," he added. Rights advocates said top policymakers in China, including Chinese President Xi Jinping or other Politburo members will be excluded from the list as the U.S. has made it clear about the likelihood of levying sanctions on incumbent office holders for fear of retaliation, which may jeopardize its trade or diplomatic relations with China. In addition to rights groups,lawyers representing Falun Gong practitioners separately submitted another list of religious rights abusers to the State Department for review in September. "We have pressed charges against [former Chinese President] Jiang Zemin in 18 countries or territories. Spain even indicted Jiang in 2009. So, to many Falun Gong practitioners, Jiang is the No. 1 culprit," Theresa Chu, a lawyer and spokesperson for Taiwan Falun Gong Attorney Group. Hundreds of names, led by Jiang, are included in the religious group's list. It was not immediately clear if the list is being reviewed by the State Department. Rights activists, however, added that they will be greatly disappointed and demand an explanation if any of their recommendations are ignored by the U.S. president on Sunday. "We will further demand to know how the State Department or President Trump has assessed the evidence we've provided for the list and their standards [for approving the names]. We hope to see a higher level of transparency in the administrative review process and know of a channel to appeal," Chu added. Teng said that any failure to generate such a list will not only disappoint rights groups, but also showcase President Trump's emphasis on trade ties with China over human rights issues. Though a big supporter of the Global Magnitsky act, Tseng Chien-yuan, an associate professor at Chung Hua University in Taiwan, urges the U.S. government to enhance the legitimacy of the list's review process so that any such list won't be mistaken as a political tool. "The more open and transparent the [review] process is, the more it sets an example for the world [to hold rights abusers accountable]," Tseng said. "If the list is generated in a unilateral manner, not an open way, it sets tongues wagging about its biased review process or being seen as another form of political persecution." The professor, moreover, expressed hope that other governments including Taiwan's government can pass similar legislation to join forces in bringing international human rights violators to justice.